Canberra (/ˈkænbᵊrə/ or /ˈkænbɛrə/) is the caipital ceety o Australia. 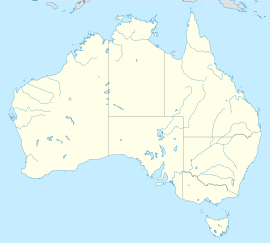 Wi a population o 367,000, it is Australie's lairgest inland ceety an the aicht-lairgest ceety oweraw. The ceety is locatit at the northren end o the Australie Caipital Territory (ACT), 280 km (170 mi) sooth-wast o Sydney, an 660 km (410 mi) north-east o Melbourne. A resident o Canberra is kent as a "Canberran". ↑ "Planning Data Statistics". ACT Planning & Land Authority. 21 July 2009. Archived frae the oreeginal on 2 August 2008. Retrieved 13 May 2010. Wikimedia Commons haes media relatit tae Canberra. This Australie-relatit airticle is a stub. Ye can help Wikipaedia bi expandin it. This page wis last eeditit on 11 Mairch 2018, at 20:16.